Our list of great gifts for the holidays is getting longer and longer. I know that I say every one is my favorite, but today, this one is the best. If you want to read about the other gift suggestions, you can find them here, here and here. Are you still looking for that perfect gift for your kids this holiday season? Or does your child have a birthday coming up? Maybe you just want fun projects to do with you kids. Maybe, you are about to head into Christmas Break and you are wondering how you are going to entertain your kids for two weeks. Look no further. You need BabbaBox. 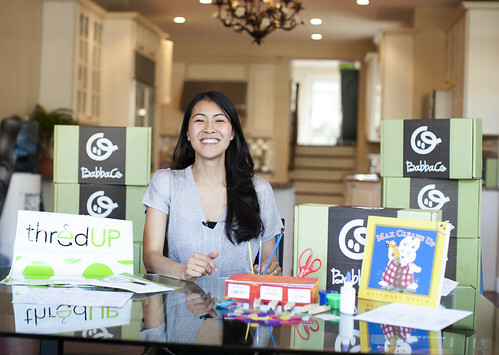 BabbaBox is a monthly subscription box that is delivered to your home with ALL the physical materials plus know-how content to really engage with your kids. And when they say ALL, they really mean ALL of it. Our first BabbaBox arrived this last week. Waiting for just the right day to open it up, and still in pajamas, our daughter and I sat down today and had some fun while we learned. Our daughter was overjoyed when we opened the box. 3 Activities, each separately packaged with instructions and teaching points. We started with the Land Art Project. Together, we learned what Land Art is, and talked about ways that we can create land art. We came to realized that our daughter is already a little land artist. She spent all Summer collecting petals and leaves and twigs to make "cakes". Then we got to work, using the materials to create. This started as a purse, and ended as a flower garden. Can you see it? I love the concentration on her face. This little decoration was my favorite. She figured out she could threat the buttons on the pipe cleaners. "To make them look like they were floating." Too excited to stop, we moved on to the next project. The instructions taught us about Impressionism. And then, using Cray-pas (oil crayons) she made her own masterpiece. On a real little canvas. When we were done, we read our new book and sat down for lunch together. What a wonderful day for both of us. Our daughter had a blast and I love that BabbaBox comes with everything that you need and that every activity teaches. I also loved not having to come up with the ideas and materials. The help was wonderful. We were even able to add the left over materials to our crafting box, to use again later. Our daughter called me up to her room tonight, just to verify that we could finish the last project tomorrow. She can't wait. Would the BabbaBox be helpful for your family? Watch the video below to see first hand, what the BabbaBox is all about!